At the end of the What is whisky? tasting event I attended, the owner of the shop kindly opened up the shelf and invited us to a few extra drams. One of the whiskies I tasted was the Bunnahabhain 15yr old. I remember being impressed by the smoothness and quality of the whisky. 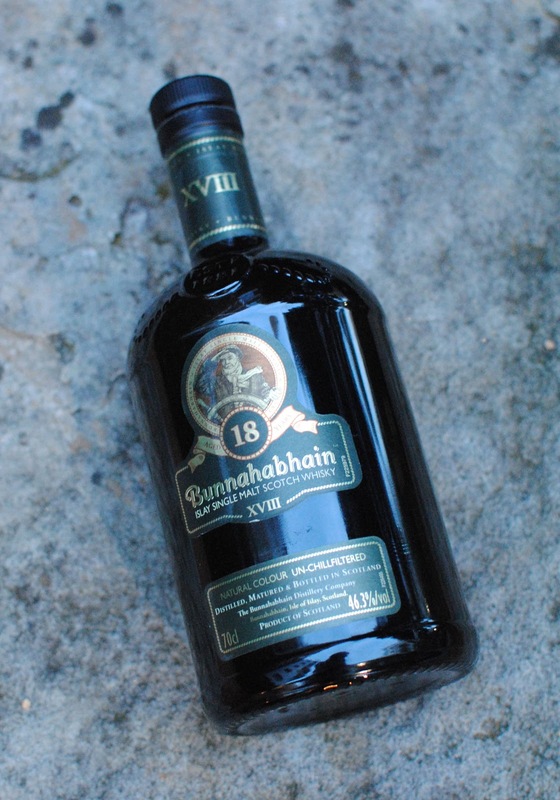 We were told that in an blind tasting session they recently held, the Bunnahabhain 18 was rated as the Islay top whisky. At that moment I was sold and new it would be my choice for the next whisky night I hosted. The Bunnahabhain 18yr old is difficult to find here in Australia and I've only seen it at World of Whisky in Double Bay at an eye watering $217. A trip back to the UK over Christmas gave me the opportunity to secure a bottle for the equivalent of $100. We really are being ripped off here in Australia! Packaging: I'm a fan of the dark squat bottle. The minimalist labels and Roman numerals give it a sense of class. The squat shape seems to give the bottle presence. My only gripe is that the dark brown glass makes it difficult to see how much you have left. Colour: Amber in colour with reddish tones. A couple of shades darker than your regular dram. Nose: An initial hit of alcohol tingles, rather than burns the nostrils, but still made it difficult for me to pick up too many flavours. Hints of sweetness, spice and oak. Palate: The first thing that strikes me is how smooth this whisky is. I've taken to cutting my whiskies with water recently, but even though this is slightly higher ABV than standard is doesn't require any water to help tame the beast. Subtle spice from the sherry casks is the dominant flavour. What I was expecting from an Islay whisky, and didn't get, was any peat. Finish: Long. The spice gently fades leaving a dry finish. A slight saltiness. The Baron thought the whisky had a similar profile to the Glenmorangie Quinta Ruban. I did a side my side tasting, and while I can see the similarities I thought the Bunnahabhain was deeper, smoother and more rounded. But so it should be at double the price. Overall a very pleasant dram. Would I but it again? Yes at $100, but not at $217. If I was to give a dram I'd say 5.5 lightening bolts our of 7.